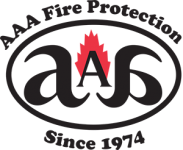 For affordable, quality commercial kitchen fire suppression services, Fremont restaurants can turn to AAA Fire Protection Services. We bring over 40 years of experience to the commercial restaurant fire suppression industry. We offer comprehensive restaurant hood fire systems along with restaurant exhaust cleaning and a comprehensive grease filter exchange service. At AAA Fire Protection Services we understand why grease exhaust cleaning is mandatory. Accumulated grease in ductworks melts and drips down into what is a small grease fire, causing the fire to grow larger and do more damage. This is why UL300 requires grease exhaust cleaning twice per year by a professional company. In addition, we make sure kitchen hood systems are properly fitted with exhaust hood filters that meet UL300 standards. We use baffle 18-gauge galvanized grease hood filters because they fit snuggly into kitchen hood systems and help to stop grease from getting into the ductworks. For more information about working with our experts, just give us a call at (800) 543-5556. Our team is happy to provide you with the answers to your questions or to schedule a kitchen walk through so we can develop a personalized quote for your kitchen.